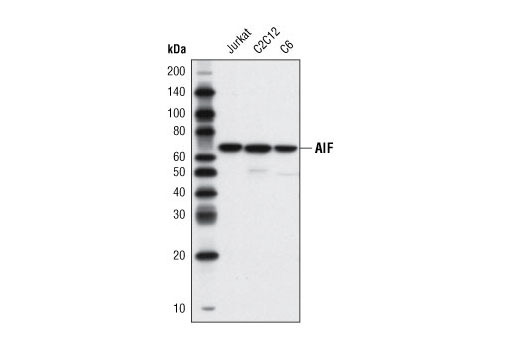 Western blot analysis of extracts from Jurkat, C2C12, and C6 cells using AIF (D39D2) XP® Rabbit mAb. 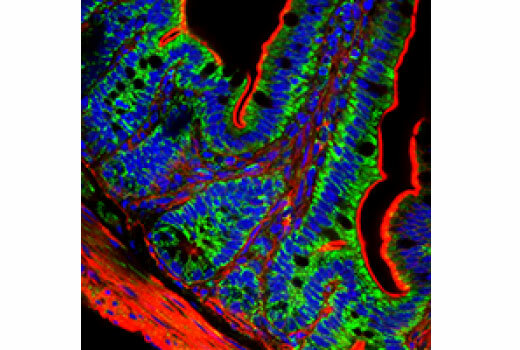 Confocal analysis of mouse small intestine using AIF (D39D2) XP® Rabbit mAb (green). Actin filaments were labeled with DyLight™ 554 Phalloidin #13054 (red). Blue pseudocolor = DRAQ5® #4084 (fluorescent DNA dye). Confocal immunofluorescent analysis of HeLa cells using AIF (D39D2) XP ™ Rabbit mAb (green), showing colocalization with mitochondria that have been labeled with MitoTracker® Red CMXRos (red). Blue pseudocolor = DRAQ5® #4084 (fluorescent DNA dye). 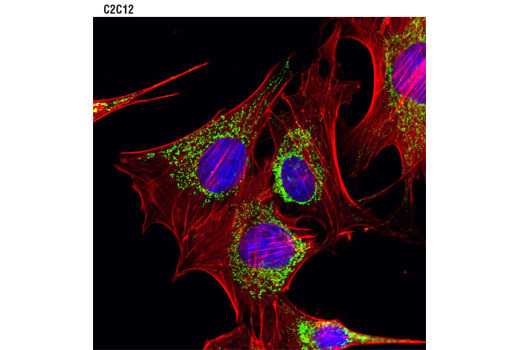 Confocal immunofluorescent analysis of C2C12 cells using AIF (D39D2) XP® Rabbit mAb #5318 (green). Actin filaments were labeled with DY-554 phalloidin (red). Blue pseudocolor = DRAQ5® #4084 (fluorescent DNA dye). 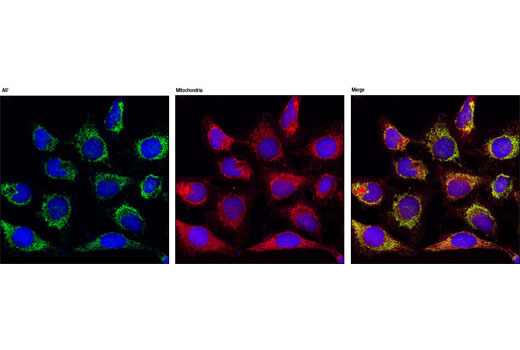 AIF (D39D2) XP® Rabbit mAb detects endogenous levels of total AIF protein. Monoclonal antibody was produced by immunizing animals with a synthetic peptide corresponding to residues surrounding Ala520 of human AIF protein. Apoptosis-inducing factor (AIF, PDCD8) is a ubiquitously expressed flavoprotein that plays a critical role in caspase-independent apoptosis (reviewed in 1,2). AIF is normally localized to the mitochondrial intermembrane space and released in response to apoptotic stimuli (3). Treatment of isolated nuclei with recombinant AIF leads to early apoptotic events, such as chromatin condensation and large-scale DNA fragmentation (3). Studies of AIF knockout mice have shown that the apoptotic activity of AIF is cell type and stimuli-dependent. Also noted was that AIF was required for embryoid body cavitation, representing the first wave of programmed cell death during embryonic morphogenesis (4). Structural analysis of AIF revealed two important regions, the first having oxidoreductase activity and the second being a potential DNA binding domain (3,5). While AIF is redox-active and can behave as an NADH oxidase, this activity is not required for inducing apoptosis (6). Instead, recent studies suggest that AIF has dual functions, a pro-apoptotic activity in the nucleus via its DNA binding and an anti-apoptotic activity via the scavenging of free radicals through its oxidoreductase activity (2,7). Daugas, E. et al. (2000) FEBS Lett 476, 118-23. Lipton, S.A. and Bossy-Wetzel, E. (2002) Cell 111, 147-50. Susin, S.A. et al. (1999) Nature 397, 441-6. Joza, N. et al. (2001) Nature 410, 549-54. Ye, H. et al. (2002) Nat Struct Biol 9, 680-4. Miramar, M.D. et al. (2001) J Biol Chem 276, 16391-8. Klein, J.A. et al. (2002) Nature 419, 367-74. Kozako, T. et al. (2015) Sci Rep 5, 11345. MitoTracker is a registered trademark of Molecular Probes, Inc.